This black wooden trinket box is the perfect place to safeguard all of your treasures! With a hidden latching mechanism for secret access, only you will know how to get to access the treasures which are stored within. 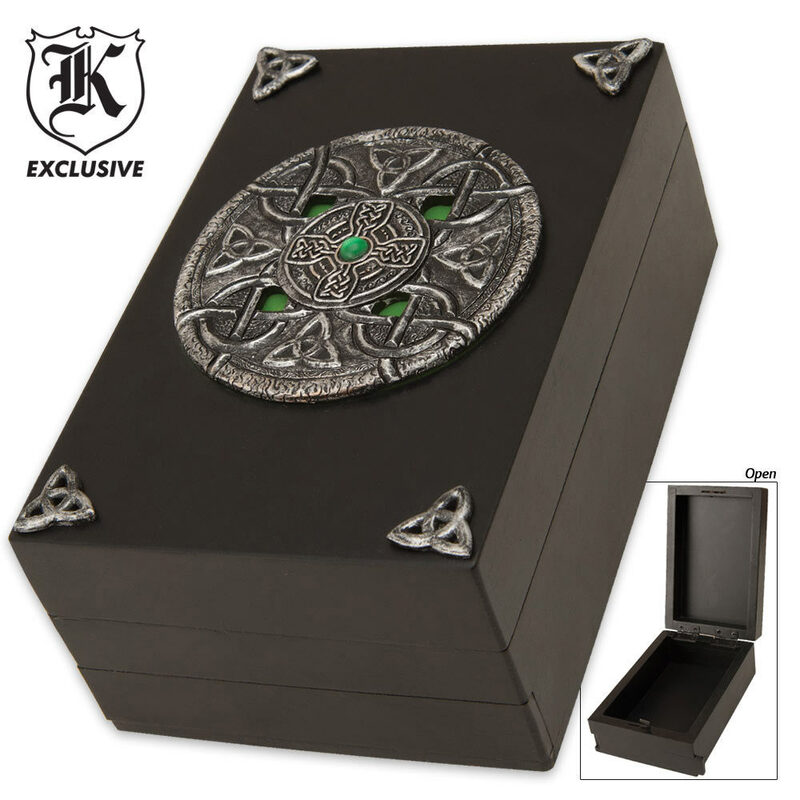 The top of the box features a poly resin Celtic emblem bearing a Celtic cross and knotwork design in the center, with small Celtic knots in each corner. Measures approximately 5 3/4 in. x 3 3/4 in. x 2 1/2 in. overall. I got this in the mail today and when I paid 14 dollars for it I wasn't expecting the best thing in the world but when I open up the package and took the bubble wrap off. It was already missing a corner piece and one of the others was half missing. The screw weren't tightened down and when I when to tighten on I realized that I was screwing into air and a slip pull pulled it right out. The sliding bar on the bottom is bowed and nearly off. I would expect something better from a dollar store for the same thing. I am sending it back first thing in the morning. Very disappointed! Lovely decorative piece I reccomend it to all my friends.